Breakfast is most definitely the most important meal of the day for me and it needs to be delicious, comforting, nourishing and filling. There is nothing worse than being hungry only a few hours after you’ve eaten, so it is all about feeling content for as long as possible, whilst giving your body the best nutrients to kick-start the day. The only way we really achieve satiety for long periods of time is by ensuring that we get good levels of protein with each meal and according to the Department of Health if you are between the ages of 19 and 50, you should consume at least 55 grams of protein each day. Alternatively you can work on the basis that you need to aim for at least 0.8 grams of protein for each kilogram of body weight (0.8/kg), so if you weigh 60 kilograms, you need to aim for at least 48 grams of protein per day. This can be challenging when you are vegan, vegetarian or even pescetarian like myself as I very rarely feel like eating eggs first thing in the morning. Fortunately our world is constantly evolving and so many new wonderful products are hitting our shelves on a daily basis. Have you ever heard of Quinoa flakes? Well, in my opinion they are pretty amazing as not only are they a good source of fibre, they also contain good levels of protein in the form of all nine of the essential amino acids. Quinoa, pronounced, ‘KEEN-wah’ originates from South America and despite the fact that it looks like a grain and is prepared like one, it is in fact a seed of a herbaceous plant. Today our shelves are stocked with a variety of different colour quinoa such as orange, red, purple, black and cream and in different varieties like whole seeds, flour, pasta, and in some places you can buy the leaves, which tastes a bit like spinach or swiss chard. Quinoa has many health promoting benefits, such as being anti-inflammatory, nutritious and gluten-free. Phytonutrients like hydroxycinnamic acid, hydroxybenzoic acid, arabins and saponins make it a powerful anti-inflammatory, which is one of many reasons I choose to include it in my diet on a regular basis. It is also rich in the powerful phytonutrient quercetin, which is used for treating a whole host of health issues, such as asthma, arthritis, cancer, auto-immune conditions, and many more. I have experimented with using traditional quinoa for porridge, but I must confess I think the flakes are far superior. 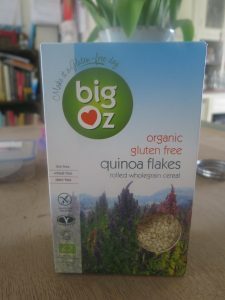 You can buy them in most supermarkets or health food shops and even though they are a little pricey for a cereal, I find mine last me a long time as I combine it with gluten-free oats. They are really easy to cook and I love that you can play around with various different flavour combinations. 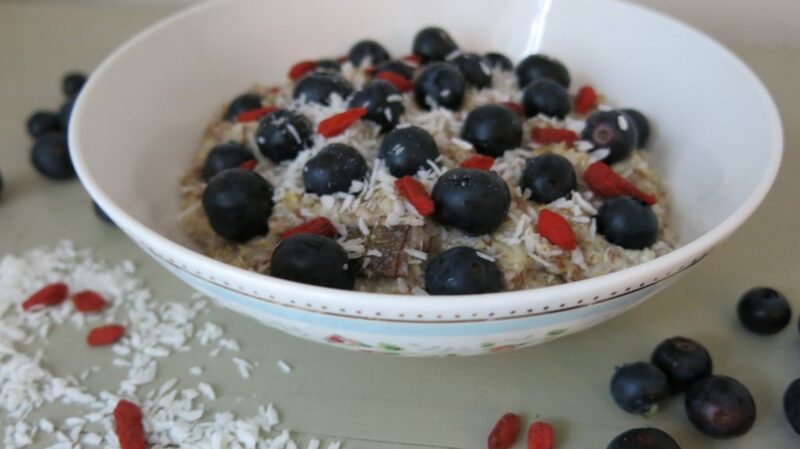 Today I am sharing with you my all time fave, which is Quinoa Porridge with Berries. Blueberries are consistently ranked as one of the top antioxidant foods, something each and every one of us need to counteract all the free radical damage and stress that our bodies are subjected to on a daily basis. 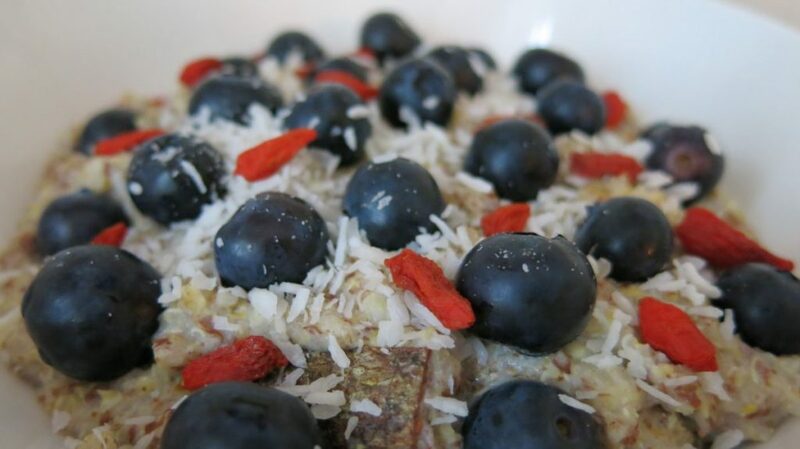 I promise to talk a little more about antioxidants in the future, for now it’s time to share just how to make this delicious and super nutritious breakfast. 1. Pop the quinoa, oats and milk in a pan and bring to boil. 3. Pop the porridge and flax in a bowl and add some fresh blueberries (or frozen if out of season) and sprinkle with pumpkin and sunflower seeds. You can drizzle a little Organic Date Syrup on it if you feel you need something a little sweeter. I prefer mine without any sugar as there is already 8.9 grams of free sugar in this meal, but if you must, choose wisely. I love adding a cinnamon bark in whilst it's cooking to add a little natural sweetness and flavour. 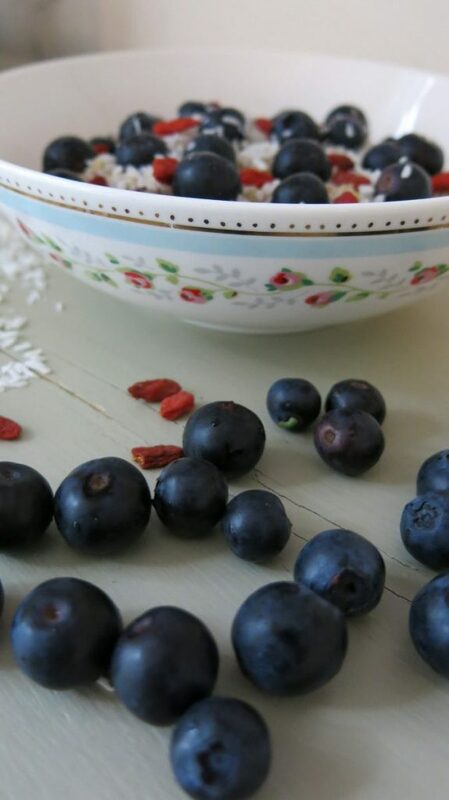 Why not add 1 Tbsp of Goji Berries to sweeten your porridge and provide some additional vitamin C, vitamin B2, vitamin A, iron, selenium and other antioxidants. This breakfast really is an amazing way to kick-start the day. You will feel full for long and avoid the horrible blood sugar crashes we so often get when we eat a light and unhealthy breakfast. What’s even better still is that your body will thank you for all the goodness that you are giving it. Gibney, M.J, et al. (2009). Introduction to Human Nutrition, 2nd edn.